I would buy and definitely recommend. I never like Palmoliveit never clean my dishes good enough for me. Until Ireceived a sample of Palmolive Clear to try in the mailed. When I tried I was amazed the soap actually stand in the water it didn't dissipate. My dishes came out clean I didn't have to rewash it. It actually clean my grease pot ... l love the smell and yes my hands was oh so soft. I liked the idea of Palmolive's Pure and Clear Dishwashing Liquid and it came in a pretty bottle so I decided to give it a try. The experiment did not end well and I ended up giving the rest of the bottle away after just a single use. First, the product is environmentally friendly which is a huge bonus. I try to be as green as possible, especially with the cleaning products in my home. Sadly, in this case effectiveness was sacrificed for greenness. The soap was surprisingly thin and I found that I needed to use almost twice as much to get the same amount of cleaning power as my usual dish soap. This took away any sort of potential financial savings I experienced when purchasing the soap on sale. This just did not clean particularly well. Just getting glasses and silverware clean with it was a challenge, let alone pots and pans. It just does not perform as well as other soaps. So, while it is great that this is environmentally friendly it is just not useful in a kitchen where you do a lot of baking and cooking. It's just not effective. Good for those with sensitive skin type, not so good on dishes. My sister-in-law has eczema and would have to wash her dishes wearing rubber gloves so the dish soap doesn't touch her hands and cause them to break out. She tried Palmolive Pure and Clear Dishwashing Liquid and it did not harm her hands in any way. When I tired it, I did not think it cleaned the dishes like the Palmolive original. I thought that it does not have much soap in it like the original Palmolive. I think the makers might have put less of the soapy stuff so it won't harm the hands of those who have sensitive skin. 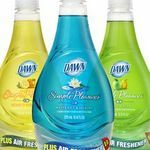 It did not clean my dishes well and, I found myself using a large bottle of Palmolive Pure and Clear Dishwashing Liquid win the same amount of time I would use a small bottle of Palmolive Original. I am the type of person who likes to have lots of soap on the sponge while doing the dishes. Unfortunately this dish soap did not so that. Again, this may be good for those with sensitive skin, but I will not be purchasing it again. The Palmolive Pure and Clear Dish-washing Soap Product is a superior dish-washing soap. The fact that it does not have toxic, earth denigrating ingredients, is what I first looked for when searching for a natural dish soap. I found it with this dish soap, an earth friendly cleaner that I can use with a clear conscience. The price was right, on par with the chemical laden products around it. Also the fact that it is a Palmolive product made it desirable, being as I grew up with the original Palmolive that I still relate to the commercial where Madge is soaking her client's nails in the green soap, as part of the manicure she was giving. It was an entertaining commercial and not so abrasive as the ads of today. This dish soap has plenty of suds. There is something quite fulfilling about having the perfect temperature, fresh sink full of sudsy water, all ready for the submersion of dirty dishes, ready to be transformed into new, ready to use dishes, waiting for the satisfaction of being laden with healthy foods that are desirous of the mouth and stomach, waiting for sustenance. The only reason I am not giving this dish soap a 5 rating, is the fact that it is rough on my skin, ironically speaking, in comparison to Palmolive being known to be gentle on hands, especially with repeated usage. I do like that the packaging of the plastic bottle is clear, so in front of my light-streaming, kitchen window, it looks rather pretty and certainly radiates with light, since there are no false colors blocking the crystal clearness of the liquid, as it catches the sun's rays and streams colors in my now-for-the-moment, clean kitchen sinks. As always, Palmolive has put out another great product. This pure and clear dishwashing liquid in "sparkling fresh" may be better for the environment but its smell is still a bit indicative of the Palmolive of old. 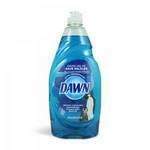 This product touts lots of suds, which it delivers and deep cleaning, which it also delivers. Palmolive pure & clear is hypoallergenic, which is good for those that have allergies and sensitivities to certain products and smells. The container is 25%-75% post consumer recycled plastic. Kudos to Palmolive for adding such an eco friendly product to the their line. I am more prone to purchase products that I know will not only work well, but are better for the environment. This 20oz. bottle of power packed dish detergent will wash a good many dishes. It is a concentrated cleaner so a little goes a long way. I recommend this Palmolive pure & clear as a good product that delivers on its promises. Concentrated, "green", free of unneccessary chemicals! Palmolive Free & Clear - what a fabulous find! A lot of us are trying to be more "green" and since i had my son, I know I have become way more aware of the chemicals and other ingredients that are now known to be harmful. 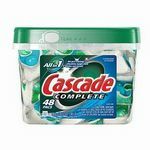 I was looking for a better dishwashing detergent and found it! Palmolive Free & Clear is a wonoderful product for so many reasons: - It's free of unnecessary chemicals, heavy fragrances and phosphates - It's made with biodegradable cleaning ingredients, non-irritating dyes and a unique hypoallergenic formula - Packaged in a sleek 20 oz. bottle made of 25%-75% post-consumer recycled plastic - Made in America! Not many products can say that anymore! - Certified Kosher. I'm not jewish but I bet there are a lot of people who would happy to learn this. 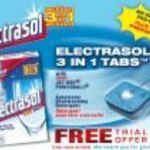 I have used this product for a while now and can say that i am really pleased to find something more "green", more local, and healthier for me and my family. I recommend this highly and hope everyone switches to this. It's better for the environment, our groundwater and our bodies! The palmolive pure and clear dishwashing concentraded soap.. IS FaLse ADVERTISMENT..... No residue fragrance free.. All lies.. I bought this product thinking about my baby.. Once I began using this product he began to vomit not regular baby spit up but vomit and very sleepy..... I tasted one of his bottle and tasted just like the scent.. Made me sick to my stomach..... I wash and rinse tons and boil bottles... I couldnt believe i could be poinsoning my baby cause of this.. I quickly washed everything with a differ soap and boiled and he stopped vomitting and is back to normal.... .DO NOIT USE!!!! Years ago I switched my cleaners brands that manufactured all natural, safe alternatives. They were hard to find and many had to be ordered through the mail. I was thrilled when I saw the Colgate-Palmolive Company coming out with their own line of natura cleaning products. 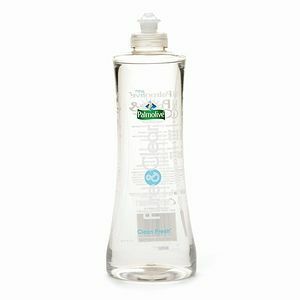 Palmolive Pure & Clean comes in a 20 ounce clear plastic bottle. I have the Spring Fresh scent, and it has a fresh floral smell that is a little bit strong but not too overpowering that it bothers me. It smells much stronger sniffing the product than when I have a sink full of suds. The label claims that this deep cleans but leaves no harmful residue behind. The dish liquid is concentrated, and it looks so clear you would think the bottle contains water! The back of the bottle states that it contains no unnecessary chemicals, no heavy fragrances, non-irritating dyes, and that it is phosphate free and biodegradable. It is also hypoallergenic, so if you have sensitive skin this might be a good choice for you. As far as how well this works, I have been pleased with its overall performance. Just one squirt makes a lot of suds, and it seems to rinse clean. I haven't really had to wash any extra greasy pots or dishes, so I cannot comment on how well it would work on those types of dishes. 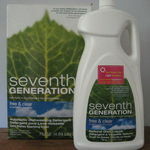 The dish soap is fine, but I think the scent of the Seventh Generation dish soaps are more to ,y liking. It's not about the good smell of the product. Behind it, there are a lot of problems. It irritates the hands and the eyes. You can feel it in every pan and coffee mug, even after thorough rinsing. You rinse a lot of water rinsing the dishes, and you still feel it in your food or drinks. Yes, it is very sudsy...but that's another reason to waste a lot of water. I would not buy it again, nor would I recommend it to anybody! I purchased a bottle of Palmolive Free And Clear some time ago. I had a coupon so I thought I would give it a try. I'm also trying to be more eco-friendly so I thought it was a win-win. It just wasn't effective enough for me. I didn't seem to cut through the grease left on some dishes and pans. I won't be buying this product again.